Kathleen Lolley’s artwork is suffused with dark magic. Flowers bloom from the hollowed out faces of a donkey and a girl. A tree bleeds from an arrow’s wound. 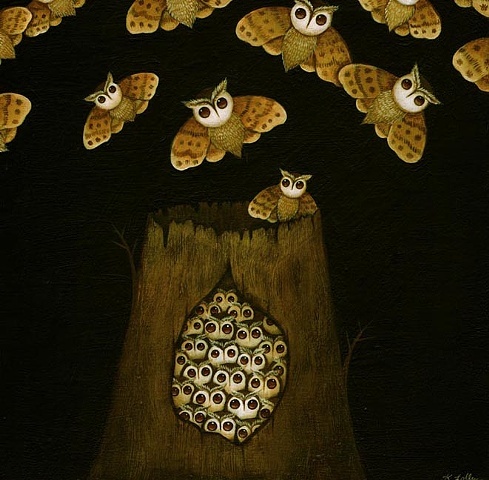 A swarm of moth-like owls with beady eyes hides in a tree stump. We love the world her work inhabits, a kind of surreal dream infused with the earthy tones of nature, and we’re honored to feature some of her pieces in the most recent issue of Sycamore Review. We’re also thrilled to be using her art on our website. To see more of her work, you can visit Lolleyland. We promise the experience will not disappoint.